Presbyterian church in Normandy Park on Saturday Jan. 26, 2013. 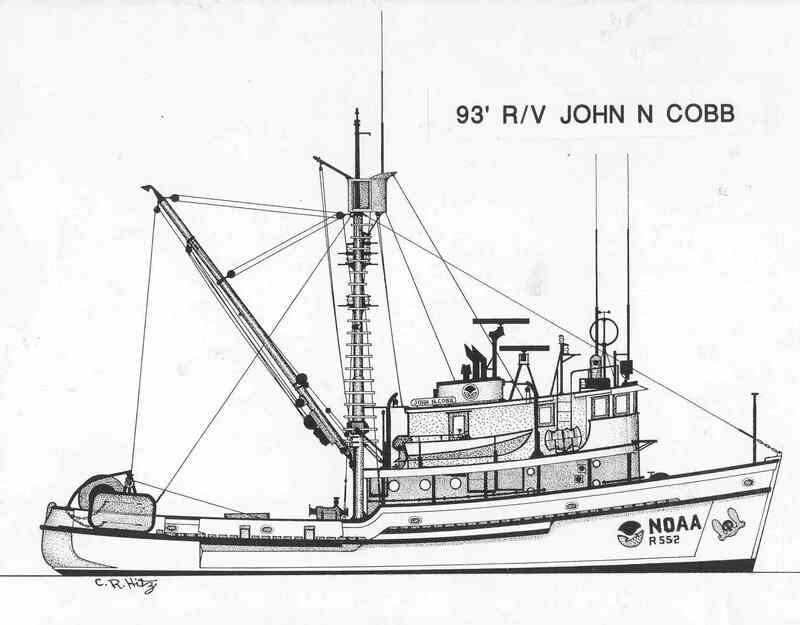 There were two tables set up with all the awards he had received during his career and one of them was a plaque with my drawing of the R/V John N. Cobb. He was proud of this vessel, since he started his full-time career at the same time that it was launched in 1950. It was dedicated as the research vessel for the newly formed federal government Exploratory Fishing and Gear Research Base in Seattle, where he was hired. During World War II the U.S. was short of many war items, including food. I remember the ration cards that gave us a small share of meat and butter when it was available. A 1942 report on the king crab survey that was done just before war started indicated that there was a resource of king crab and bottom fish in the Bering Sea, so the government started looking at the oceans for food. By the time the war ended there were plans for exploratory bases throughout the country to determine what resources were out there. Lee was just getting started in this exciting endeavor after returning from World War II as a veteran who served in China and then graduated from the U/W College of Fisheries in 1949 on the GI bill. From 1950 to 1953 he had a full-time job with the exploratory base in Seattle and began looking for new resources in the waters of the Northeastern Pacific, but the base’s mission changed in 1954, when the federal government faced a crisis. U.S commercial fishermen claimed that Japanese high seas salmon fisheries were taking Bristol Bay fish from the west side of the dateline in the central Pacific, and that the treaty drawn up after the war allowed them to do so. So the mission of the Cobb changed, this time to sample the North Pacific Ocean, along with other chartered vessels, to determine where salmon migrated and how they mixed in the North Pacific after leaving their spawning grounds. However Lee felt that this was not his calling, so he left the federal government and went to work with the State of Washington trawl fisheries. This move gave him the opportunity to understand groundfish fisheries and to get to know the fishermen. While he was with State he developed a voluntary log system for them to record their catches, which is still used today, and this gave him the opportunity to talk to individual fishermen. He learned that they did not trust government biologists because they were thought to be connected with enforcement. With this experience he had gained, Lee was a natural choice to head the Federal Exploratory base when it was looking for a new director in 1959 and had gone back to its original mission. In 1958, when I began my graduate work at the College of Fisheries the school had guest speakers who lectured on various fisheries subjects and one of them was Dayton L. Alverson, who had just returned from an FAO United Nations Food and Agriculture Organization conference on world fishing methods, held in Hamburg, Germany. He spoke about the distant water trawling fleets of the world and the change that was starting to occur with the introduction of stern trawlers. While he was in Germany he had the opportunity to go aboard two different types of distance water trawlers. The first was a newly built side trawler similar to Adler of the Pioneer class built between 1956 and 1958 which was later sighted off the Oregon and Washington coast in 1965 (1). The design of the side trawler has proven itself over the years to be ideal and so was used by most fishing nations. 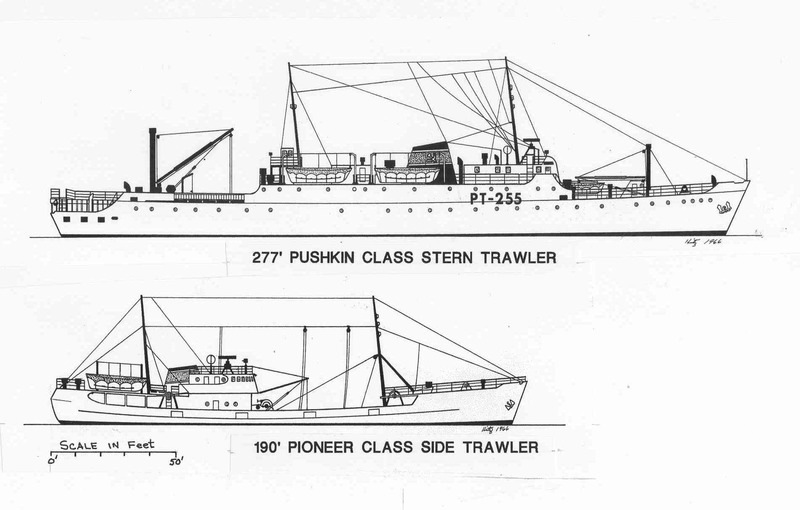 The second was a new experimental stern trawler of the Pushkin class which was just beginning to be produced for distance water fleets, which differed completely on how it handled trawl nets and what was done with the catch. It towed the trawl from the stern and pulled the fish catch up a stern ramp to the upper deck like whalers did with whale carcasses. Then a hatch was opened the catch was dumped belowdecks, where it was processed in a factory. The side trawler, on the other hand, towed the net from the side of the vessel and lifted the catch out of the water over the low side. That catch was sorted on the open deck. During my graduate work at the College of Fisheries Dr. Delacy, my advisor, arranged for me to meet Lee Alverson in his new office across the Montlake Bridge in the federal government’s Montlake Lab. He had just been appointed the director of the base, and I was to talk to him regarding his knowledge of rockfish, which was the research I was interested in. I went to his office on the second floor of the building, was ushered into his office, introduced myself and told him why I was there and that I wanted to know more about the Rockfish Sebastodes. He told me that the rockfish were a large group in the Pacific and he believed that one species, the Pacific ocean perch, would dominate the commercial catch in the future. He also talked about their research vessel John N. Cobb finding an unknown seamount off the coast of Washington, a mountain that rose up near the ocean’s surface and was now called the Cobb Seamount. Longlines had been set across it and came up with a number of large red rockfish or red snapper, Sebastodes ruberrimus. We discussed other aspects of that group and the timing of their spawning. I had a notebook in which I was trying to record what he was saying and, as I got up to leave and headed for the door, he came out from behind his desk, reached out and grabbed my notebook and went back to his desk and started reading what I had written. He said “You misspelled this fish and that fish” and on and on. I was embarrassed because of my weakness as a speller and that he was pointing it out to me. Finally I left with a red face and my corrected notebook and felt that if ever there was a job with Exploratory Fishing, I would be the last to be considered. Later on, I learned from the office secretary that Lee also was a bad speller and that I probably had made his day when he corrected my notebook. I was surprised when he hired me. The next 10 years, when I worked for him between 1960 and 1970, were exciting. One of the concepts he drove home was to interview fishermen whenever we had the chance, to try to learn what they were thinking about exploring for new or unknown resources and to reiterate that we were not involved with enforcement. One interview I stood on the dock looking down on a trawler, calling down to a man butchering an illegal halibut on the hatch and asking if I could come aboard. He looked up and said “Who are you and what do you want?” I said I was a biologist working for Lee Alverson’s exploratory group and I had no enforcement authority. He said, “Come aboard then” and we had a good talk. When I was hired in 1960 I described such a visit when I accompanied Lee on one of those interviews (2). He would stop by a vessel that he spotted along the waterfront, often occurring on his way to or from work when he drove along the Seattle waterfront. The information that he got in those interviews helped in planning the exploratory trips of the Cobb. 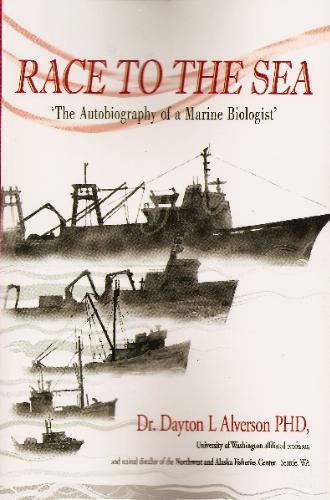 Lee Alverson’s autobiography, “Race to The Sea” (3) gives insight into his extraordinary life. I was anxious to get his book when it was first published so I called him and ask if we could come out to his house and pick it up. He said yes and we went out to Normandy Park and saw him and his wife, Ruby, in their home after so many years. We admired his wall hung with all the awards that he had received and he pointed out the plaque of the John N Cobb. We talked about the old exploratory group. When we left he autographed the book: “To Bob Hitz, one of the great exploratory scientists who served back when it was “fun”. Best wishes in the new century.” It was certainly an amazing time. I hope my posting on Carmel Finley’s blog will capture the excitement that I felt, and will help establish the history of the Exploratory Fishing and Gear Research group that of which I was a part for 10 years. This entry was posted in Dayton Lee Alverson, Environmental History, Fisheries policy, fisheries science, Fishing, History of Science, History of Technology, Ocean fishing, Pacific Fishing History Project, Rosefish, Sebastes rockfish, Soviet environmental history, Soviet fishing and tagged Bering Sea, Cobb Seamount, Dayton L. Alverson, Pacific, Pacific Ocean, science, Washington, World War II. Bookmark the permalink.